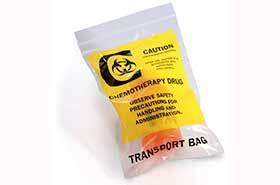 These clear bags have a reclosable closure for safe transport of chemotherapy drugs. Pre-printed yellow and black chemotherapy symbol for easy identification. Shelf life of 5-10 years when properly stored. This product complies with California Proposition 65 and all applicable CONEG heavy metal restrictions.